The controls on the Samsung Galaxy Grand take after the same general formula as what you'll find on most Samsung smartphones. Below the screen we find three keys - the capacitive Menu and Back keys on either side of a hardware Home button. The keys are well sized and spaced to allow comfortable use and the capacitive touch technology makes sure the transition between them and the screen is seamless. Above the display you can see the earpiece, a couple of sensors and the 2 megapixel front facing camera, which can do video-calls. 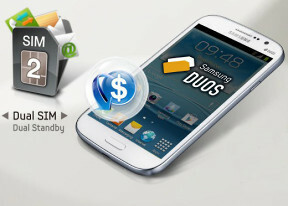 The duos logo is there to remind you that you can pop in two SIM cards at once, in case you ever forget, and is only present on the I9082 model. The top of the phone features just the 3.5mm audio jack. At the bottom are the microUSB port and the mouthpiece. The microUSB port supports MHL, enabling HD video out (up to 1080p) and multi-channel audio output. On the left side of the Samsung Galaxy Grand we find the volume rocker, while the power/lock key is symmetrically placed across on the right. There's no dedicated camera shutter key. The 8 megapixel camera lens, LED flash, and loudspeaker grille are the only things which adorn the back of the device. The back panel covers the entire phone's back, is a fairly easy remove, and fits tightly in place, no squeaks and wobble. Underneath the battery cover, you'll find the two SIM compartments, as well as the microSD card slot. Accessing the primary SIM and microSD requires you to remove the 2100 mAh battery, which means hot-swap is out of the question. The secondary SIM (on the dual-SIM I9082 model) is accessed from the bottom right and is hot-swappable, although you still have to remove the back panel. In terms of handling, the Galaxy Grand is about what you'd expect from a 5 inch mid-range device. The bezel is a bit too wide and the slippery plastic cause some problems, but if you have large enough hands (or are willing to use both of them most of the time) you will be fine.